Are you ready to make your hair smooth, shiny and heath in a simple and easy way? No time wasting, No burning on your hair, No pain No hurt to your scalp and hands, No fatigue at Salon……MiroPure hair straightener brush will let your dream come true! You can experience gorgeous sleek salon hair styles every day at home, in hotel or anywhere you want. MTC(Metal Ceramic Heater) is the new heating standard for hair appliance, MCH hair straightener fast heating up less than one minute, reducing heating response times resulting in reduced straightening, hair styling time compared to traditional hair straighteners. Save Energy, More Durable, Lasts Longer, saving 20%-30% energy than PTC heaters. Put your worries away. The cord is nice and long. It rotates so it doesn’t get tangled. DOUBLE IONIC SRRAY FOR HEALTHY SILKY HAIR: gives your hair a smooth, silky, natural lustrous look by sealing the hair cuticles- reducing frizziness, split ends, and knotting. It gives you natural healthy silky looks rather than flat burnt look and leaves your hair easy to manage. 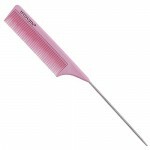 HIGH DENSITY OF NANO COMB BRUSH FOR CURLY HAIR: Make it way much easier for curly hair, Straight and frizz-free hair in just several minutes, also provides a massaging effect that benefits the scalp and simulates hair follicles. TAME THE WILDEST LOCKS WITH FIVE DIFFERENT HEAT SETTINGS: MiroPure Straightener has been described as a secret weapon in the quest for dream hair. Your Miropure can be adjusted to five different settings from 150℃/302℉ to 230℃/446℉. Suitable for all hair types: thin, fine, bleached, wavy or curled. IF YOU’RE STILL USING A PTC HAIR STRAIGHTENER – YOU’RE MISSING OUT. MTC is the new heating standard for hair appliance. What does this mean for you? Heat Quickly, Most Evenly in less than one minute, Save Energy, More Durable, Lasts Longer, significantly reduces overall straightening, hair styling time compared to conventional hair straighteners. TEMPRETURE LOCK AND AUTO SHUT OFF FUNCTION FOR SECURITY: temperature lock function can avoid temperature changing intentionally when doing hair styles, even more secure with auto shut off function. you’re protected by a 360 day, no-questions asked money back guarantee and world class personal customer service!